﻿﻿A guide detailing how you can customise your SimpleHelp apps or integrate them into your website and third party software. Please Note: for the purposes of this guide we have used the address http://1.2.3.4 as the server address. Where you see this you should substitute your own SimpleHelp server address. A simple but effective form of branding is to embed the SimpleHelp app download buttons into your existing website. Once embedded the SimpleHelp components appear seamlessly alongside your existing images, text and other branding providing a fast, simple and highly effective way to give your customers a consistent support experience. Note: Make sure to replace 1.2.3.4 with the address or hostname of your server. Required The src line should contain the domain name or IP address of your SimpleHelp server. Replace /customer with /technician to embed technician download links. online - the online standalone is a small executable that bundles the essential components required to start the application. Additional requirements on demand are downloaded when required. This is the recommended way to launch an application. offline - the offline standalone is a larger executable that contains all essential and optional components. Here nothing is downloaded on demand. applet - use an applet browser plugin to launch the application. When the launch button is pressed the applet is loaded, and is then tasked with starting the application. applet_run - use an applet browser plugin to launch and automatically connect. The applet is automatically launched, and the customer connected, without the customer having to click a button to start the launch. Optional Set showImage to no to hide the image. A simple integration showing a custom logo and only the single online app download option. Another integration which provides the user with multiple launch options. A minimalist integration showing only the download button. Note: Browser plugins are often automatically disabled and can make sessions harder to start. We suggest utilising the standalone executables where possible. See existing technician account details, create new accounts or remove existing accounts. Assign technicians to group, specify filters and perform general account management tasks. View the list of machines registering with the server. Collect hardware and monitoring information from a remote machine. View the list of historical sessions and collect details about each session. ​See the HTTP web API documentation for more information. 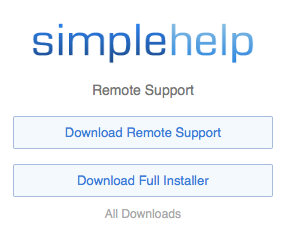 SimpleHelp customer and technician downloads can be configured by passing in options via the download page URL or in the src element of the embed script. Configuration options are included in the downloaded application permanently and will apply every time the application is run. This allows you to preconfigure settings that override the SimpleHelp defaults. The following options are available for the customer, technician and access downloads. language The language code of the application. SimpleHelp supports English (en), Dutch (nl), German (de), Portuguesse (pt), Swedish (sv), Italian (it), Spanish (es) and French (fr). width The width of the application window, in pixels. height The height of the application window, in pixels. The following options apply only to the remote support customer application. connectnow Log customers directly into the waiting queue, skipping the disclaimer and details entry steps. For more information see the section Passing Customer Details into SimpleHelp below. invite Log the customer into the SimpleHelp server using a specific invitation code. queuepassword Log in using the specified queue password. requestelevation SimpleHelp, by default, requests the customer to elevate on Windows. Set this to no to skip this step. filetransfer Set this to no to disable file transfer. chat Set this to no to disable customer chat. techniciangroup Only allow technicians in the specified group to see and connect to this customer. details_width The width of the details window, in pixels. details_height The height of the details window, in pixels. disclaimer_width The width of the disclaimer window, in pixels. disclaimer_height The height of the disclaimer window, in pixels. Customers that join the waiting queue are visible to all technicians. If you wish to have customers be visible to specific technicians you can specify the technicians or technician groups on the customer link. The following options apply only to the technician application. technician The technician username to use for automated login. password The technician password to use for automated login. group The technician group name to use for automated login. machine A URL encoded machine name to connect to. If specified, the session will launch and connect directly to this machine. SimpleHelp allows you to launch the technician session user interface from the command line. 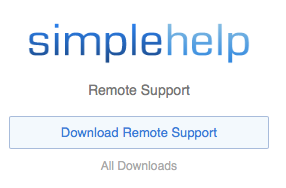 This is useful if you wish to integrate SimpleHelp with another application. JW_machine_filter=<any data> - the machine to connect to, found by a filtering search. The filter will match all machine data looking for a match including IP address etc. To test your filter you can open the Technician Client and type the text into the Filter box in the access tab. Your text should match one machine only. NOTE: On Mac OS the command is 'open Technician.app --args ' and then these arguments. On other operating systems the command is just the executable and then these arguments. You can use any of the parameters mentioned earlier in the App Downloads section for the customer client in exactly the same way to configure whatever you wish. NOTE: On Mac OS the command is 'open Customer.app --args ' and then these arguments. On other operating systems the command is just the executable and then these arguments. NOTE: You may need to surround the arguments with double quotes " to make sure any spaces are preserved. For more information on how to configure the remote access client for silent or preconfigured installation see this document. Send emails to technicians, customers and administrators when sessions finish. Populate a database with customer information. Log failed technician log in attempts. Send email alerts when remote machines become available, or go offline. Log technician usage, customer activity and session details.